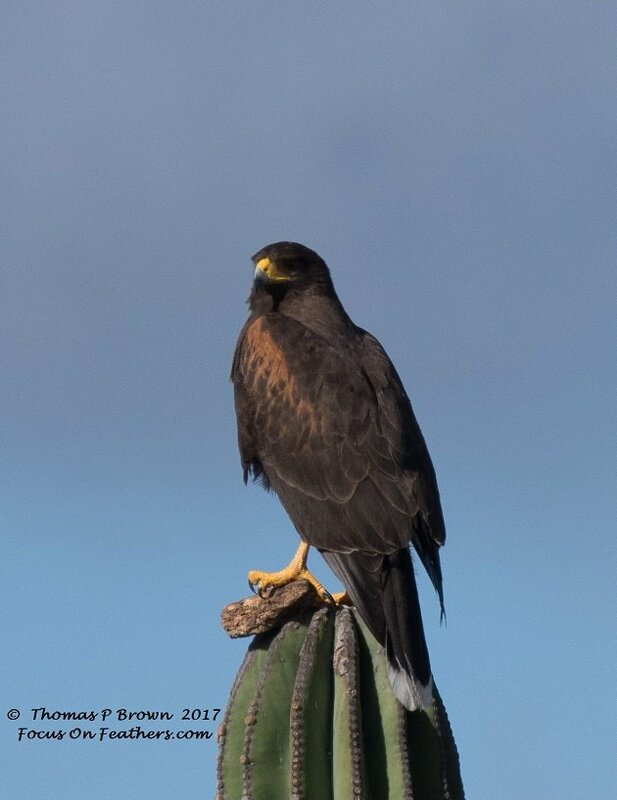 For as long as I have been living here in Mexico, I have truly enjoyed watching the Harris’s Hawks antics. 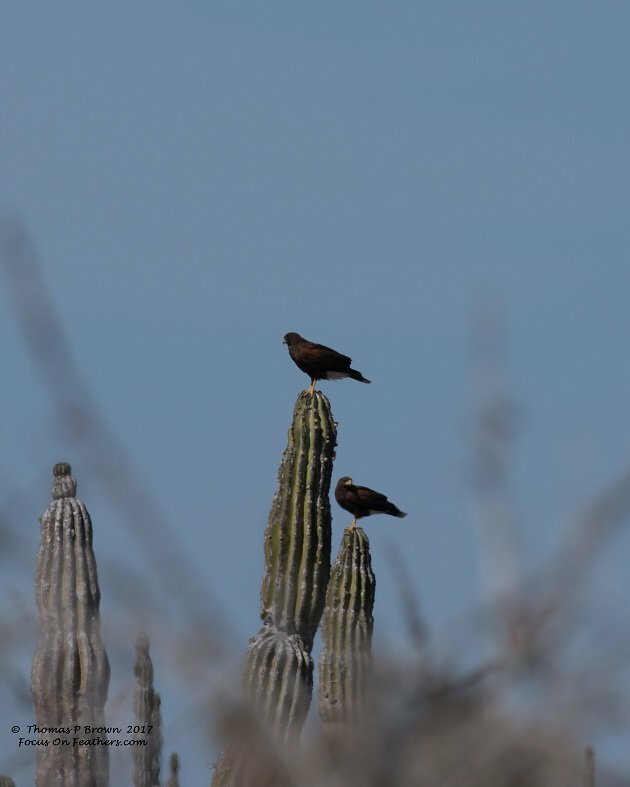 Soaring on the warm desert updrafts, or sitting on a group of cactus tops, always in groups of two, three or more. Their proclivity for living in small social groups was fact that I learned much later. 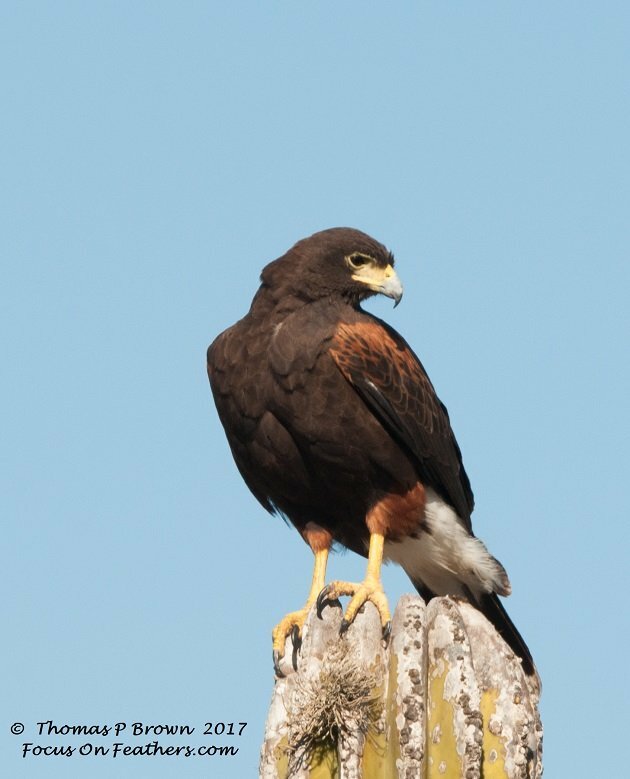 This medium-large hawk, given it’s name by John James Audubon after his good friend, Edward Harris, has also in the past been known as the Bay-winged Hawk, or Dusky Hawk. They have adapted a form of communal living, to the point of cooperative hunting techniques. One of these methods is where one bird will fly down thru an arroyo, and spook out the game for its waiting members of the pack. This way of hunting has proven to be very successful, as sometimes there are as many as 7 birds all working together. 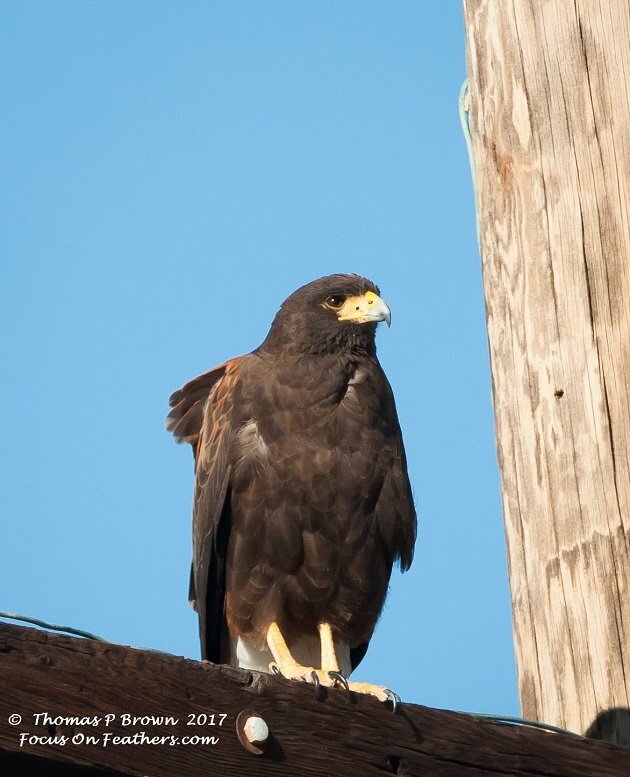 The area that the birds are living in will predicate what becomes the normal prey for the Harris’s Hawk, but those here on the Baja target Blacktail Jackrabbits, Cottontail Rabbits, California Quail, and many other species of birds and small mammals. The P. u. superior is found in Arizona, and on the Mexican Baja is the subspecies I am familiar with. The P. u. harrisi can be found in southern Texas, Eastern Mexico and much of Central America. 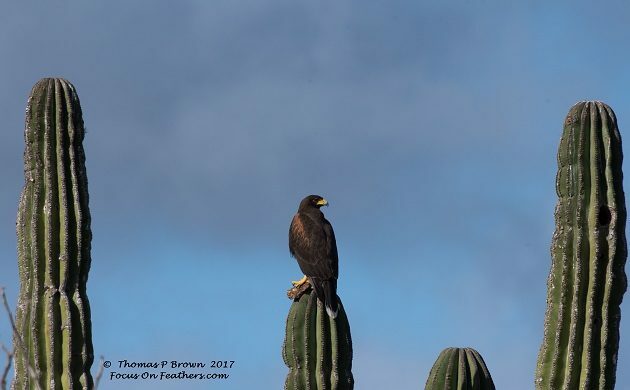 There were a pair of Harris’s Hawks that were flying up and down onto this cactus one morning while I was out near Rancho Innocente. I spent quite a bit of time trying to get close enough to find out what it was they were doing. It turns out, they were picking up this rock, then dropping it, flying down, pick it up and drop it again. they repeated this several times before getting bored with the game and flew away. I tracked down the cactus they were using and there was nothing below it, but a rock? Who knows what they were doing, but they seemed to be having so, I guess it doesn’t matter!